Echternach — FANUC’s new collaborative CR-14iA/L robot is having its European premiere at the Hannover Messe (hall 17, booth A42). The green robot is an addition to the CR series, and combines the features of the smaller CR-7iA with those of the larger CR-15iA. The CR-14iA/L was developed to be able to lift heavier payloads than the CR-7iA and, at the same time possess a greater reach. The collaborative robot can handle payloads of up to 14 kg with a reach of up to 820 mm. However, the maximum reach of 911 mm can be used with a payload of up to 12 kg. The tried and tested development philosophy for the collaborative robots of the CR series has been implemented for the new robot as well and the mechanics used in the series have been combined with a highly-sensitive sensor. The result is a solution that is both efficient and safe. The CR-14iA/L is essentially a larger long-arm version of a CR-7iA. The heavier payloads are achieved with slightly modified mechanics and slightly adapted software parameters. In the CR series, the new CR is a smaller version of the CR-15iA, which has a payload of 15 kg and a reach of 1,441 mm. 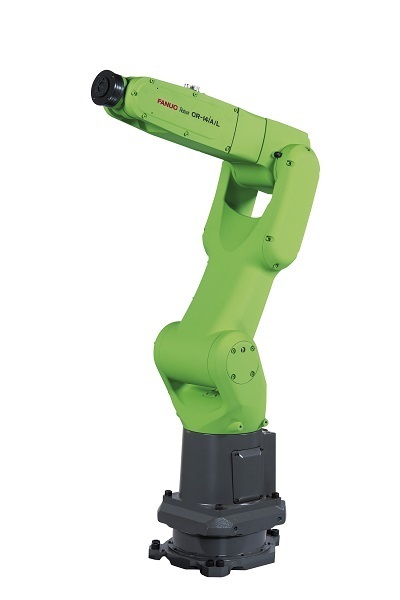 The repeatability of the six-axis robot is ± 0.01 mm. The maximum travel speed is 500 mm/sec. The decisive factor, however – as with all collaborative robots – is the maximum contact force. In this respect the CR-14iA/L clearly meets all safety specifications. The design of the gripper and the shape of the easy-to-use workpiece are key practical factors in terms of travel speeds. FANUC’s philosophy is not only "Service First", but also "Safety First". The robot is controlled by the familiar R-30iB Plus controller in the Mate Cabinet version. The combination of the CR-14iA/L with a mobile platform has already been achieved and introduced in Japan. A manufacturer-independent combination of FANUC robots with multiple mobile platforms (AGV) is planned for the European market. As with FANUC’s other robots, the CR-14iA/L can be used universally. Claude Seiler, European Technical Support Manager says: "For a small robot it has a comparatively long reach, which means that it can be used not only for applications in limited spaces, but also for those for which a heavier payload is an advantage, such as when loading and unloading machines." The kinematics and flexibility of the slim-profile CR-14iA/L mean that it can work close to the robot base, thus making the best use of the available workspace, making it ideal for space-saving installations. We are exhibiting at Hannover Industry Fair, hall 17, booth A42. Този уебсайт използва “бисквитки”, за да ви предостави най-добрите възможни услуги. Използвайки уебсайта, вие приемате употребата на “бисквитки”. За повече информация относно обработването на лични данни от наша страна, моля, кликнете тук.